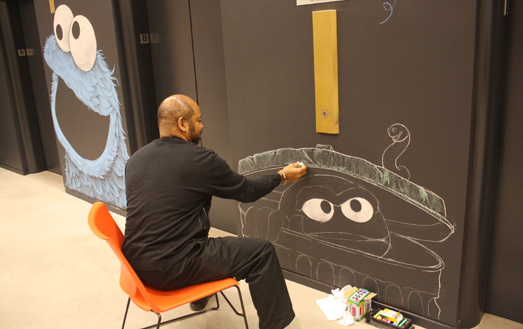 Louis Henry Mitchell was recently asked to draw Sesame Street Muppets on the chalkboard office walls of Sesame Workshop, the nonprofit educational organization behind Sesame Street. 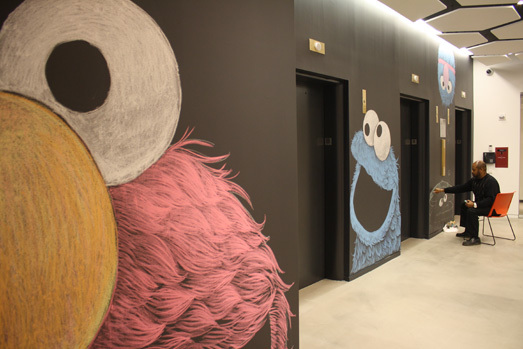 On the Sesame Workshop’s blog, Mitchell talks about his creative process and gives a rare glimpse of the Workshop’s 8th floor New York City offices with images of him working on the chalk characters. So cool! As the drawing evolved, I began to realize what was unique about both the surface and the chalk. I could use the black wall to shape their smiling mouths and to make their eyes pop. It also created natural shadows in the characters’ fur, giving it an especially textured, vivid look. The chalk was so cooperative. 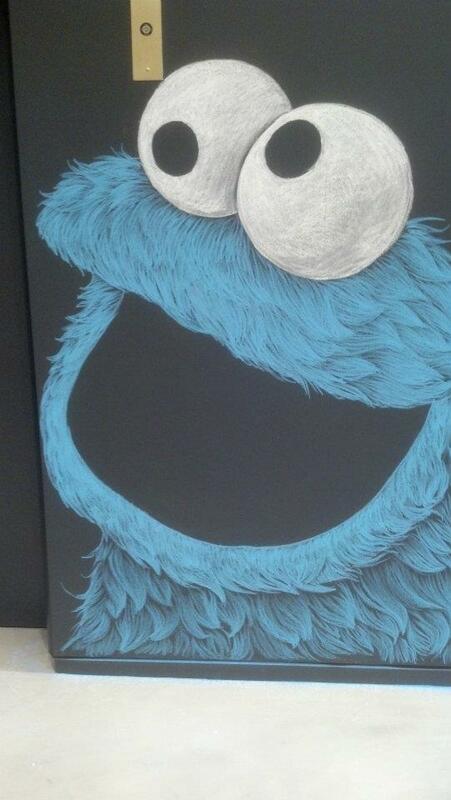 The drawing of Elmo became a model for the drawings of Grover, Cookie Monster, and Oscar the Grouch with Slimey. But Big Bird was still to come and I did not know how I would accomplish the feather texture. Each drawing has something unique about it. 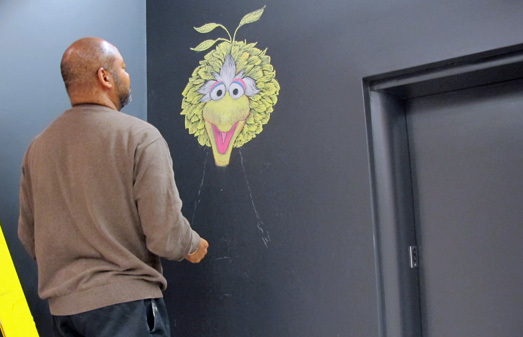 The drawing of Big Bird is actually life-sized: eight feet, two inches tall! It’s the first time in all these years that I’ve actually drawn a life-sized version of Big Bird and I learned how to create the feather texture as I drew him. I drew Grover upside-down, which I had never done before. 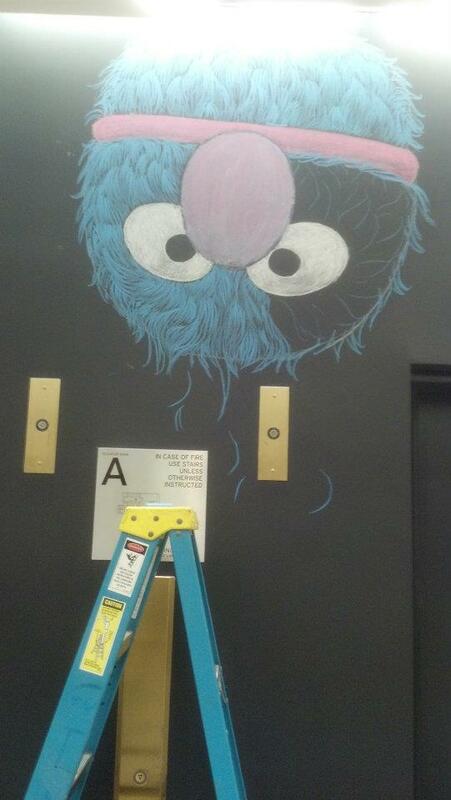 And I was able to make Oscar’s trashcan look completely solid despite using a minimal amount of chalk.